Spring is my favorite season. 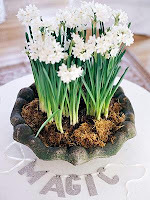 It is the time of the year when flower bulbs begin to shoot up through winters layer to say hello. Buds on my favorite flowering trees like red bud begin to pop out for a bright burst of color to the landscape. 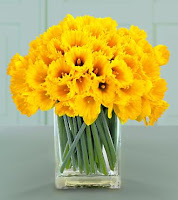 Before the grand spring show, I love shopping around for bright spring flowers to brighten up my house. 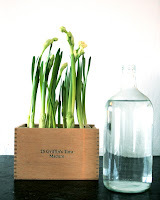 The farmer's market often have buckets of daffodils and grape hyacinths waiting to be taken home. 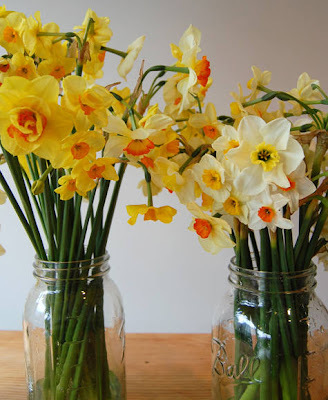 Here are my favorite spring flowers to use for a centerpiece or used as single stems in a bottle or jar. 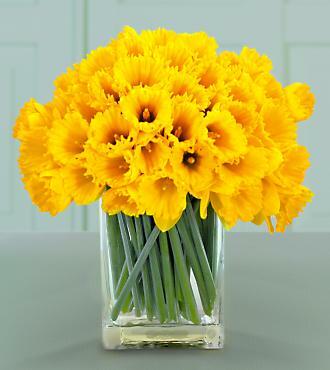 Daffodils are grown in many varieties, each with its own bloom color, shape and size. 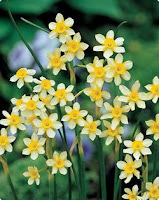 Golden dawn daffodils have creamy white petals and an egg yolk color center that contrasts with the pale blooms. 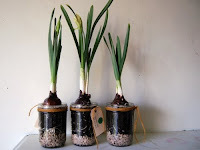 There are also miniature daffodils that look lovely nestled in a small jam or jelly jar. 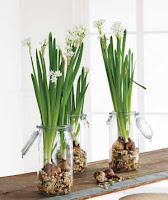 Grow your own paperwhites at home. Start with a shallow bowl, vase, urn or whatever water-tight container you have around the house. Fill the container with with water and moss or small pebbles (to help retain the moisture). Nestle the bulbs into the moss and watch the blooms come to life. Ranunculus flowers are one of my favorite flowers. Their multi-layered and crepe thin petals come in a rainbow of colors. The bloom shapes are perfect nestled in a vase to set on a foyer table as a warm welcome to the home. 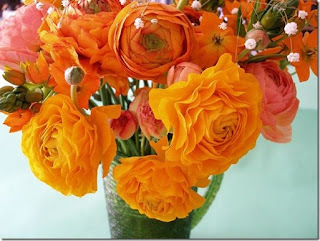 Ranunculus also make long-lasting bouquets and will keep their color and vibrancy for weeks. 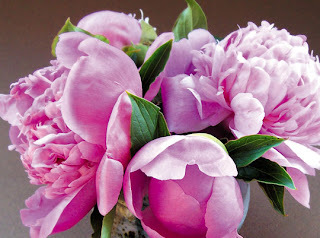 Fluffy pink peony blooms stuffed into a vase might be one of the loveliest things in the whole wide world. Spring blooming anemone flowers come in an array of colors, including these bright red blooms. Aren't they exquisite! Have you tried reusing existing objects for decoration that you might have otherwise tossed? What happens to your all your junk around around your house? Pure design to me is when you recycle items from around your house to turn them into creative designs for your home. We all have items we throw away, replacing with a new shiny version that we think looks better. Before you toss anything, think to yourself, "can I reuse this somewhere?" One idea is with old clothes pins. I know that my grandmother has had the same clothes pins for years and years. 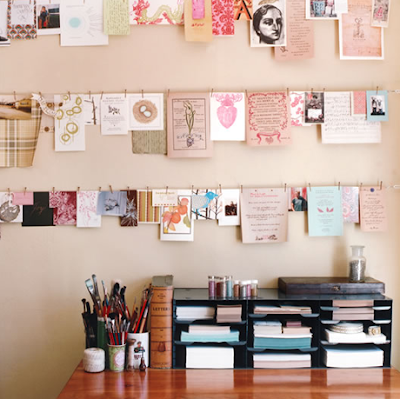 One idea is to try reusing them to hold up your favorite postcard or photograph. String them behind your desk or above your bed for a makeshift collage. Another idea is with old socks. Yes, I said old socks (just make sure you launder them before you begin!). Who doesn't have an old pair of socks jammed in the back of the dresser. 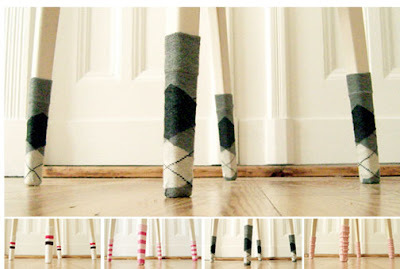 Try reusing them for the bottom of your dining room chairs as their own personal chair socks. Simply cut the bottom where your toes rest to create an opening in the bottom of the sock. Slide the sock onto the feet of the furniture to add color while protecting the floors from scratching. Who doesn't get junk mail EVERY SINGLE DAY. Along with glossy magazines and newspapers, I accumulate stacks upon stacks. Most people end up tossing them, recycling at best. Here's a way to reuse all that paper. All you need is a pair of scissors, glue, card stock, and a frame. First you'll cut the old junk mail/newspapers into thin long strips. Make sure they are big enough for your frame. Adhere them to a piece of white paper with a clear glue stick. Next create a silhouette out of piece of card stock. 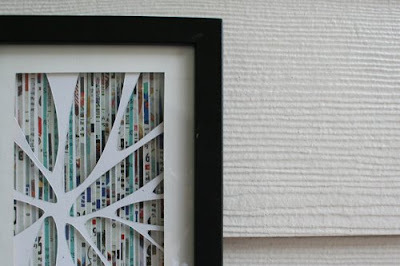 Place the paper-mounted, recycled strips behind the cut-out silhouette. Place it in simple black frame to showcase your new artwork. I am on the hunt for an affordable, eco-friendly/chic sofa. One that has sustainable material but without sacrificing quality and softness. It also needs to be chic, classic and timeless. To much to ask? Here are my to picks for cool eco-friendly sofa's. Did I mention that they're priced under $1500. Check it out. 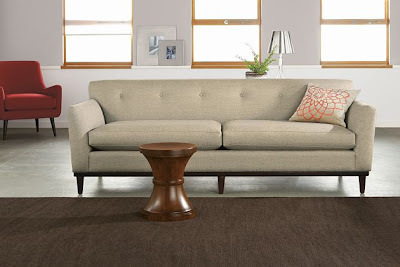 Clean, simple lines makes the Parlour sofa from CB2 a great pick. This couch is certified sustainable and includes a kiln-dried hardwood frame and soy-based seat cushion make from polyfoam and fiber. The bright yellow fabric is 100% cotton and looks comfy and cozy. Also looks striking against the subdued gray walls. Made in the USA, this couch comes in at $999! Another CB2 find that is reminiscent of a 1950's style sofa and super chic. The low tufted back and modern arms give it a classic, vintage style. The Avec sofa is another eco-friendly sofa made from sustainable wood and soy based foam. 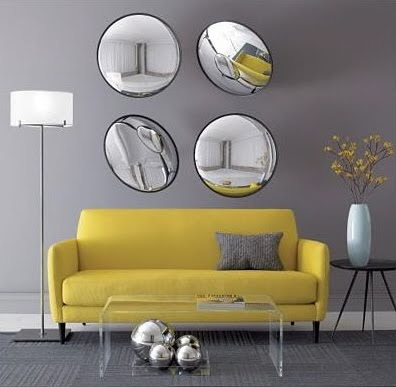 The rich gray color looks elegant with colorful pillows. Cool gunmetal legs combined with the soft fabric makes this eco-chic couch the perfect spot to curl up on for cat nap. It's also affordable and comes in at $1199. 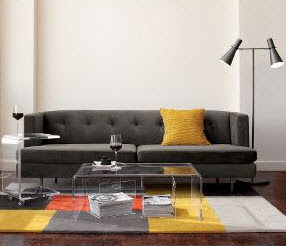 West Elm has created a simple, earth-friendly sofa that is priced at $799! The rich colors of the Cooper couch are simple and classic. This super affordable sofa has many green features including recycled seat springs, soy-based padding and eco-friendly hardwood. The fiber on the seat deck is also made from recycled carpet and did I already mention it's $799. As part of the Cooper collection, you can also buy a matching armchair and ottoman! You can't go wrong with the Eugene sofa from Room and Board. This classic, sophisticated design is a throw back to the 40's and will provide a cozy respite after a long day. Room and board promotes its commitment to sustainable practices and used eco-friendly flexible foam for their upholstered furniture. The soy-based foam replaces some of the petroleum-based ingredients used in traditional polyurethane sofa cushions. This lovely little piece does not break you budget and comes in at $1199. It also comes in a few rich colors that will have your living space smiling.